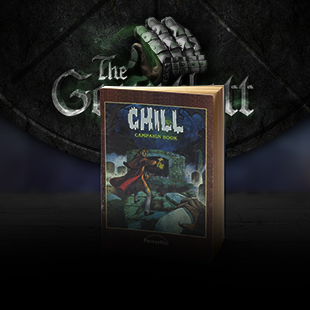 Chill is one of those games you may have heard about, if you've any interest in horror gaming, but seldom seen. It's had a pretty tumultuous publishing history, and been officially out of print in English for over two decades. Now, thanks to some horror fans in Ohio, it may be about to get a new lease on life. First published by ex-TSR veterans who formed their own company, its publisher Pacesetter came out with the main Chill box set, over a dozen scenarios, and a fun German-style board game, Black Morn Manor. The concept was simple enough: the player characters are members of an organization called SAVE, aka Societas Argenti Viae Eternitata or The Eternal Society of the Silver Way. You've volunteered to defend the world against supernatural peril, and put your life on the line to keep Dracula and a host of other ghouls at bay. Chill in its 1st Edition was one of those games that sounded interesting, but wasn't a must-have; the central idea was fun, but its monster list was the same old vampires-ghosts-werewolves that everyone had seen before. Some of the scenarios were interesting, but the 1984 box set didn't fire imaginations, and it didn't help that Call of Cthulhu had cornered the horror market several years prior. That hoary old Games Workshop elder, White Dwarf Magazine, said of Chill in its issue 61 review: "A few years back this would have shaken the RPG community, now it's second rate." Pacesetter went out of business in 1986, and Chill went down with the ship. Chill languished in darkness until Mayfair resurrected it, gave it a 2nd Edition and a host of new supplements. This is the version that most people remember, the scary one, with a host of interesting ideas and a world very much in peril. The monster list got a much-needed makeover, SAVE started crumbling, and the characters became the last line of defense in a hostile, frightening world. Unfortunately, in 1993 Mayfair decided it didn't want to be in the RPG business and Chill got put on the back burner, though Mayfair did keep the game alive in .pdf format. Then in 2012 Mayfair sold Chill to Martin Caron, who made a deal with the folks behind Growling Door Games to bring this old fear factory back to the market. It's just finished a successful Kickstarter, raising $40,375 on a $25,000 ask. I took some time out to talk with Matthew McFarland, one of the two brains behind Growling Door, the other being his wife Michelle. If you recognize those names, that's because you're a White Wolf, Dungeons and Dragons or Shadowrun fan; Matthew's been heavily involved in the World of Darkness since 1998, and Michelle's an industry veteran who's worked on Dungeons and Dragons, Shadowrun and Battletech, among other properties, for over a decade. Adam Gauntlett: What do you feel is the essence of Chill? Matthew McFarland: I think it's people coming together to face the Unknown. Characters in Chill aren't superhuman, they're not necessarily highly trained. What they have in common is the willingness to stand up. That kind of everyday heroism is appealing to me personally, but I think where it becomes essential to Chill is the intersection of that heroism and the presence of a malevolent supernatural force. It's different than a Cthulhu based game, because in that kind of game, you aren't ever really going to make a difference - the Great Old Ones will eat us one day and the best you can do is hold on to your sanity. But in Chill, the little victories mean more, because the end is still in question. Maybe SAVE can defeat the Unknown, but even if they can't, they're damn well going to fight it. AG: Chill, first published by Pacesetter back in 1984, went out of print when Pacesetter collapsed. Had its publisher not gone out of business, what do you think would have happened to Chill? Does it have the staying power of a Call of Cthulhu, or Vampire the Masquerade? MM: Given how well Mayfair did with the property in the 90s, and the response we've gotten from the many enthusiastic players of Chill 1st and 2nd Editions, I'd say it probably would have stuck around. Chill didn't have Lovecraft to hang its hat on, true, and it didn't have some of the more innovative hooks that Vampire did, but it cast a pretty wide net, and that gave it a lot of potential material as a horror game. I think that had Pacesetter not folded, we might already have seen a third and perhaps a fourth edition of the game, but as the saying goes, how could things be other than they are?